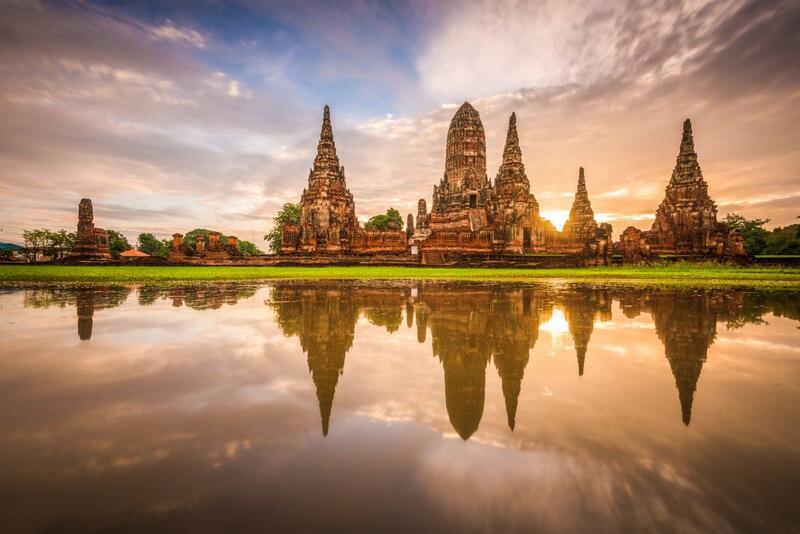 One of the most popular day-trips from Bangkok is the UNESCO world heritage recognized ancient city of Ayutthaya. The city was once the capital of the ancient kingdom of Siam. There are many ancient temples in Ayutthaya historical park and around the city. 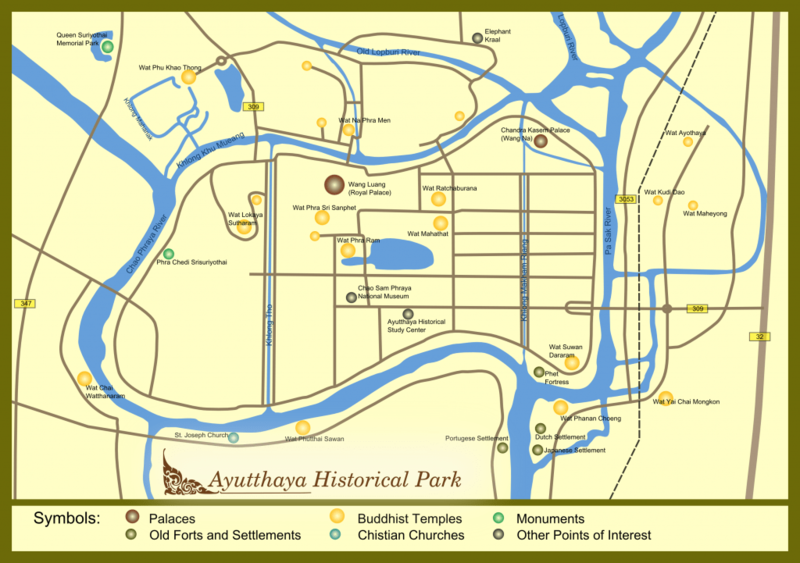 Ayutthaya, founded in 1350 became the largest city in the world by 1700. The population was around one million people and filled with ornate palaces and temples. Its wealth generated by trade with countries from all over Asia, the Middle East, and Europe. However, it all came to an end in 1767 when war with Burma led to the sacking of the city. It was mostly burnt to the ground and the capital of Siam moved to Bangkok. Today only a small part of the ancient capital survives. 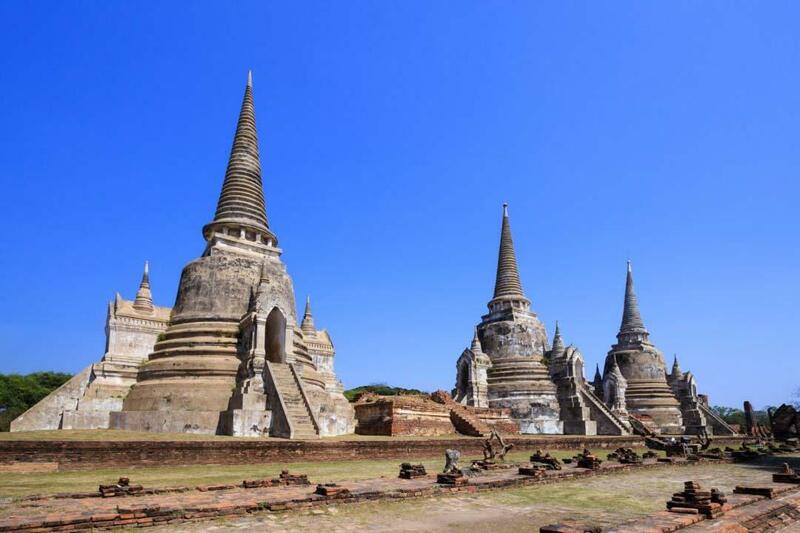 The ruins mostly in the form of palaces and temples are in an area called the Ayutthaya Historical Park. The park is on an island surrounded by three rivers. One of the main sights is Wat Phra Sri Sanphet, the largest temple in Ayutthaya. It stands in the grounds of the ancient Royal Palace of which only a few ruins remain. The temple is famous for its row of restored chedis. The temple is open from 08.00-18.00 daily and admission is 50 baht. Next door is Viharn Phra Mongkolbopit which contains a large seated bronze Buddha image housed in a rebuilt replica of the old Assembly Hall of Ayutthaya. Admission is free. Also in the Historical Park is the 600-year-old Wat Mahathat which was one of the most important temples in ancient Ayutthaya. 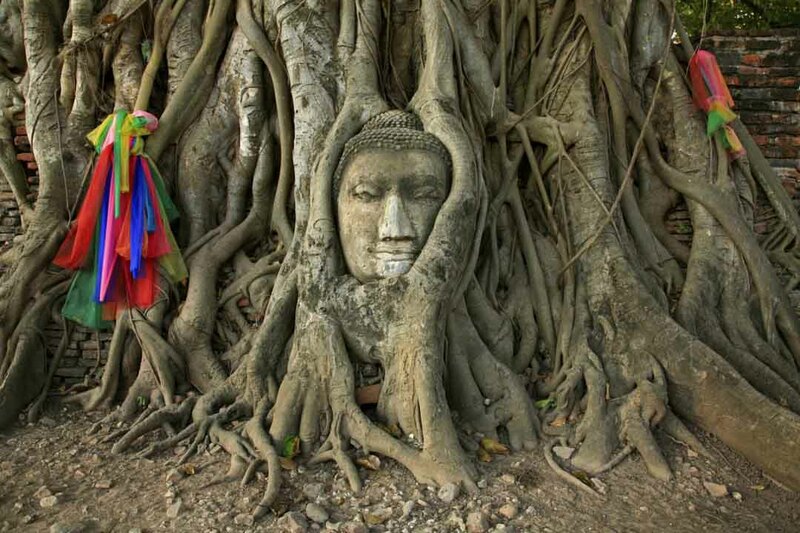 It is famous for the Buddha’s head enveloped in tree roots. Admission is 50 baht. Also, worth visiting on the Island is Wat Lokayasutharam. It contains a massive reclining Buddha image at 8 meters high and 42 meters long set among the ruins. The image dates from the early Ayutthaya period. Outside of the Island is Wat Chaiwatthannaram. This is one of the most visited and best-preserved ruins on the banks of the Chao Phraya River. Built-in 1630 it’s in the architectural style of Cambodia’s Angkor Wat. Its distinctive feature is a large central prang surrounded by smaller prangs. Open 08.30-17.00 daily. Admission is 50 baht. Also, worth visiting is Wat Yaichaimongkon. 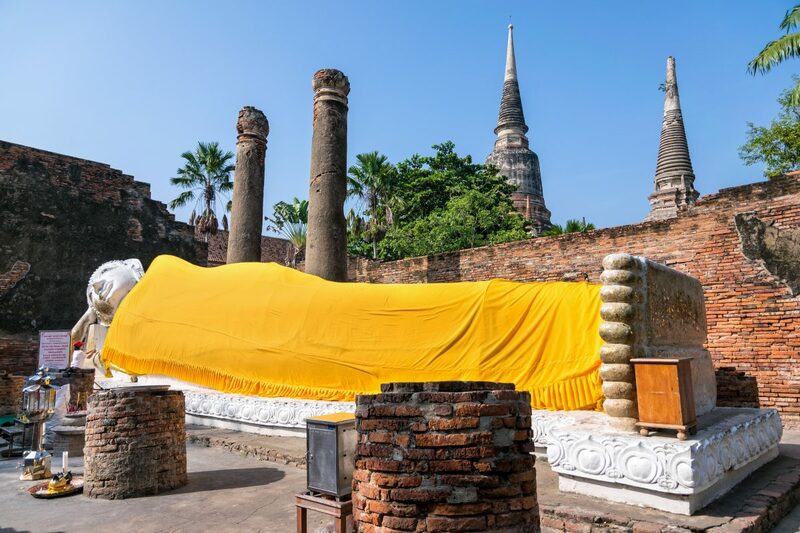 It features a large reclining Buddha in saffron robes as well as a large chedi wrapped in golden robes. The Buddha & Chedi are in a courtyard lined by a row of Buddha images wearing saffron robes. Open 08.00-18.00 daily. Admission is 20 baht. Finally, one Ayutthaya period temple that escaped being destroyed by the Burmese and remains in perfect condition is Wat Na Phra Men. The temple features a large 6 meter Ayutthaya period golden Buddha clothed in royal attire and a Dvaravati period green stone carved Buddha. Both Buddhas are extremely valuable national treasures. Open 08.00-18.00 daily. Admission is 20 baht. Ayutthaya is only 70 km’s from Bangkok making it perfect for a day trip. There are many guided tours and good public transport links by train and mini-van. You can book mini-van tickets from both Khaosan Road & Mochit Van Station here. There is no bus service to Ayutthaya City. There is a good choice of day trips by bus, private car or boat. They all visit the most popular temples. The tour may also include a river cruise, a bicycle tour, a photo-taking tour, monkey feeding or a visit to the Royal Palace at Bang Pa-In. Other tour options include visiting the ancient city of Lopburi (monkey temple) and Khao Yai National Park (cowboy country). The Tours take 5-12 hours and cost from 1300 baht. Click here for the full list of tours. Trains to Ayutthaya leave from Hualamphong Station between 04.20 and 22.25. There are 32 departures a day and the journey takes 1.5 – 2.5 hours depending on the type of train. Tickets are 245-345 baht for air-conditioned 2nd class or 20 baht for 3rd class. From Ayutthaya, trains depart for Bangkok from 02:27 to 21:42. Ayutthaya railway station is just across the river from the Island. There is a ferry service at the pier behind the station to take you across for 5 baht. Passenger vans run from Bangkok’s Morchit 2 Bus Terminal to Ayutthaya leave every 30 minutes. 06.00-17.00 and take 1.5 hours. Private services also run from Khaosan Road. From Ayutthaya. Vans leave for Morchit 2 from the corner of Naresuan Road and Naresuan Soi 1 from 06:00 to 17:00. A taxi to Ayutthaya is good value if there is a group of you. It costs from 2000 baht each way for a group of four. You can also hire a private van for 2500 each way, seating up to nine people. You can book taxis here. Ayutthaya is a good place to spend a few days if you have time. There are many good hotels & hostels. The best areas to stay are the historical park or on the riverside. You can rent a bicycle for 50 baht a day though you must leave your passport as a deposit. Cycling around the historical park is easy though trips further afield will be tiring in the heat. There are plenty of tuk-tuks in Ayutthaya. You can hire them for the day, by the hour or for single trips. A single trip in the city is around 100-150 baht, while outside the city center 200 baht. The hourly charge is 200-300 baht per hour. All prices are negotiable for the vehicle and per person. You will find Tuk Tuk’s waiting outside the popular sites or you can flag down a passing one.